This review is part of our D E L H I issue. Conducted by Vritti Bansal and Akul Dhingra. Contemporary Indian dawned on Delhi’s restaurant horizon with Indian Accent in 2009. 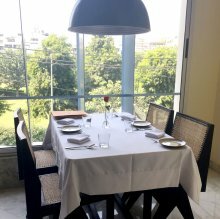 Varq, Farzi Cafe and Masala Library followed suit, although none managed to touch the bar set by the pioneer at The Manor (now relocated to The Lodhi). 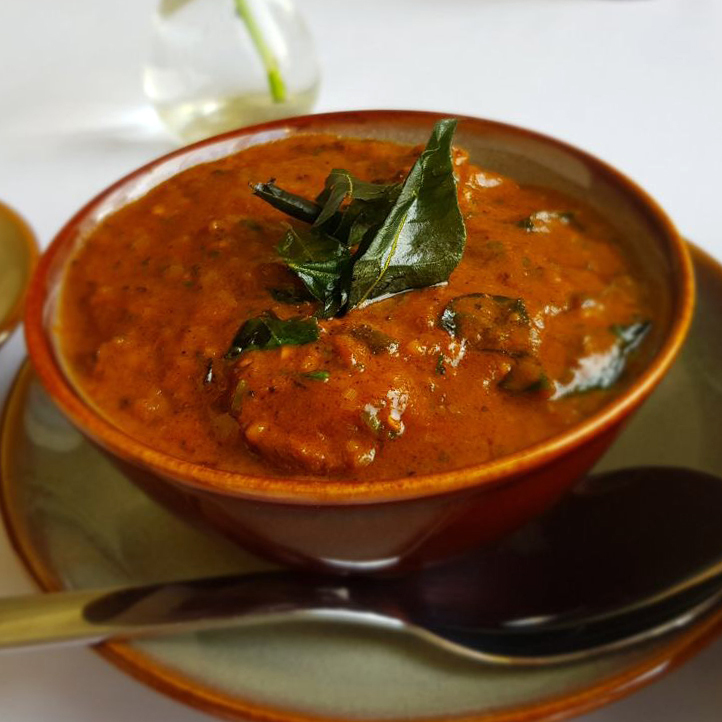 After years of seeing restaurants dabble in fusion Indian cuisine only to appear to be apprentices of Indian Accent, we’re glad to see a more original newcomer. Now having been open for a few months, W.D. House is well-groomed, broad-minded and chilled-out. It claims to be “inspired by early modern India” and “embody a young nation’s spirit of being progressive”. A spacious, naturally well-lit dining room is flanked by a small, green balcony. Plain white tablecloths, wicker-back chairs and vases with lone, long-stemmed roses are a nod to postcolonialism. Alcohol is served, but the absence of cocktails is excusable with an interesting drinks list that includes jamun & dill mattha and khubani & adrak soda. We started with a tall glass of kokum saar (Indian mangosteen, garlic and heeng): sweet with a hint of umami from the mangosteen; slightly garlicky coriander and asafoetida powder floating on top. The menu, divided by course, does a round of Kashmir, Gujarat, East Bengal, Mizoram, Assam, Tripura, Madras, Sri Lanka, The Philippines, Japan, Vietnam, Thailand, Indonesia and Scotland. Realising that we'd require more than one visit to be able to sample to our hearts' content, we settled on trying one traditional and one experimental recipe for each course. Murg bano, served on a cushion of onions, was tender and roasted well. It came drizzled with green chutney that one of us found to add too much saltiness. This is, nonetheless, one of the better kebabs in the city. "Cumin scallops" came with a cauliflower and parmesan puree (an excellent combination), green apple, and edible flowers that as much as we tried to identify the flavour of, were tasteless. The scallops had been seared just right—neither chewy, nor soggy. The creamy cauliflower and parmesan sauce added a wonderful dimension to the light, pudgy rounds of clam. We transitioned to the next course seamlessly with a gorgeous chunk of caramelised eel on top of a cylinder of shiitake fried rice. Lotus stem chips were a perceptive addition; they provided a nice, crunchy break from the gooey rice and fish. Sweet and lightly piquant, they also prepared us for spicier pastures. An elu mas boreta, goat meat curry prepared Sri Lankan-style in a peppery gravy, was exceptionally tasty. Pro tip: don't expect Malabar parotta-like flakiness from the Ceylon paratha that comes with it—it's meant to be slightly doughy. We made it a point to finish every morsel. As much as we'd have liked to try dessert, our meal had us too full. But we know we'll be back to try the edamame dumplings, misa mach poora (grilled prawns), koldil aru manxo (quail) and mostly all of the desserts.